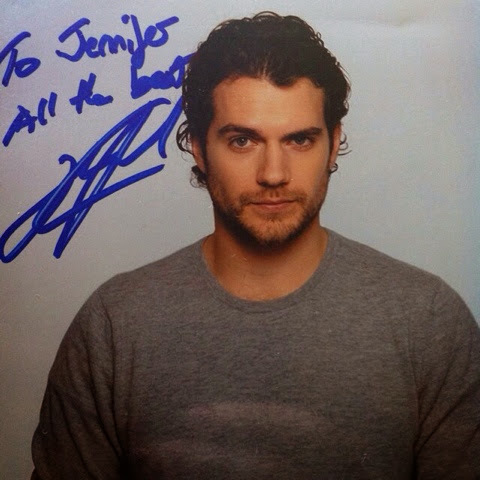 If this isn't a killer look.. Jennifer (jensautographs on IG) just shared the picture Henry autographed for her in 2011. Don't stare at it too long, or you won't be able to look away.. swoon x 1000! - Want your own Henry autograph? here's what you need to know. Talk about a hard-working MAN. Not only has Henry been busy reprising his role as the Man of Steel in Detroit, he's also been doing post-production work on The Man from U.N.C.L.E. Ozone Music and Sound shared this Facebook update today, with that great picture from when he first visited their studio in April. Post by Ozone Music and Sound. We can tell you WITHOUT A DOUBT you are going to LOVE his suave portrayal as Solo. Superman who?.. just wait. Back to Batman v Superman, WNEM went looking to see what they could find out about the MI set being prepared for filming at an old Girl Scout camp. WATCH their report. We're also keeping a close watch on another set being built in downtown Detroit, that should be ready for action a few weeks from now. And don't forget, we're headed to Comic-Con two weeks from tomorrow.. and who knows what SUPER reveals await us. We'll be bringing you daily updates, so make sure you're following us on twitter and Facebook. Finally, you've probably heard the rumors of an alleged fake Batman v Superman script floating around linked to actor/comedian Kevin Smith (here's the background). Smith addressed those rumors today, and confirmed he did not write that script. The plot thickens..
Riddle me this, riddle me that! Did I write a diversionary script for the Bat? Let me tell you a story... Tomorrow morning at 11am PST. No, I didn't write a fake Batman v Superman script. But I HAVE kept busy regardless... http://t.co/dPdZtLTzie Thanks for saying #WalrusYes !